Naomi Osaka edged Petra Kvitova 7-6(2) 5-7 6-4 to capture the 2019 Australian Open title in an epic final and with that, became the world no.1 for the first time in her career. The drama and tension was unremitting to the very end. The Japanese held three championship points in the second set on Kvitova’s service at 5-3, before the Czech erased all of them with incredible hitting. Osaka then blew the chance to end proceedings in the next game as well, as she failed to serve for the championship. However, that failure did not affect her sheer belief and confidence as she regrouped to stroll through the third set and capture her second Grand Slam title and as of Monday, she will officially be ranked as the number one player in the world. For Petra Kvitova, who is a 2-time Wimbledon champion, and was making her first appearance in a major final since that brutal knife attack a couple of years ago, was left reeling on numerous break point chances she failed to convert in the first set, while Osaka maintained her consistent serving to force a first set tiebreak, which she subsequently won 7-2. The second set saw a rejuvenated Kvitova make her first move as she took a 2-0 lead early on. However, Osaka managed to retrieve the break immediately before breaking the Czech on her next service game to love, to take a commanding lead. While serving to stay in the match at 3-5, Kvitova faced three championship points, but she managed to save all of them and Osaka was staring at an almighty collapse. The 21-year-old never really recovered from that moment on, until the beginning of the third set, when she finally composed herself to break Kvitova for a 2-1 advantage. She managed to hold on to that lead throughout, before serving for the match at the second time of asking. With the win, Osaka now becomes the first women’s player to capture back-to-back Grand Slam titles after winning her maiden slam since Jennifer Capriati in 2001. 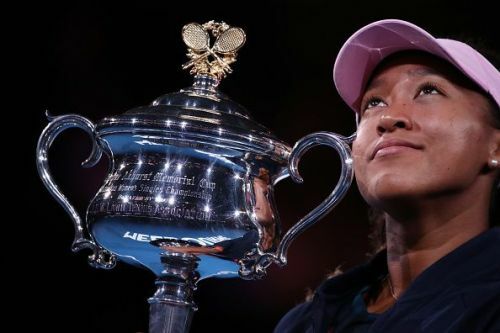 Her US Open triumph last year, which was overshadowed by the Serena Williams and Carlos Ramos controversy, will surely be forgotten for the moment as the young Japanese enjoyed a very special night in Melbourne by becoming the new world no.1. This was a further reminder of the remarkable progress and meteoric rise she has made over the last 12 months, under coach Sascha Bajin. Osaka was ranked no. 72 at this time last year and she is now 2-time major champion, having never made past the quarter-finals of a Grand Slam prior to the 2018 US Open.